I have a brand new 'BIG' Cloche. I've been waiting for Marty to have a cloche party so I could show off my 'BIG' CLOCHE. Actually I have been doing some fun decorating at My Cozy Corner lately. I made the rose patterned pillows this spring, and a couple of weeks ago I covered two more pillows on the sofa that been on there for more than 20+ years. I'm following the decorating tips for coffee table appeal. I love my new cloche. I will be busy finding wonderful things to display in it all year long. When I started to blog I didn't know what a cloche was. How quick I learned. Go Here to see a review of the past cloche parties I have joined. As you can see I have acquired a few real cloches. A little fruit under cover and on the sofa table behind the love seat I have put some of my fresh Lavender in a vase. I also enjoy my vignette using my thrifty finds. A Lenox vase and candle holder from the thrift shops in our area. A cloches can be used to display treasures from a vacation or treasures from home too. The little ducks I bought from a little mexican boy in Puerto Vallarta, Mexico. He was so cute and the little ducks go so well with our Cozy Corner. And a little jar of lavender buds for accent comes from my lavender plant in my garden. I made this heart shaped lavender sachet with the same rose patterned fabric I used for the rectangular pillows on the sofa and love seat. I love the way it hangs from the lamp. My newest hobby is to go to the thrift shops and find inexpensive decorating books. They are not new, but the rules of decor stay the same. Just a little update once in awhile. I've found the painted letters are very popular now. So I bought this letter Y at TM. Sweetheart painted it black for me in a heartbeat. He is so talented and willing to please me. Even after 52 years. LOL! 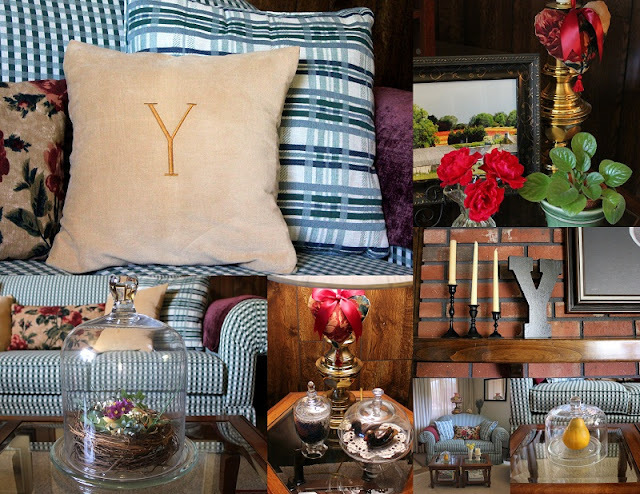 As I was buying the letter Y I thought I would embroidery the letter Y on one of my new pillows. But I forgot how to embroidery. I thought I would have to do some samples first...That would be to long and you can see me in tears before I was finished with the project. Well, I decided to have the monogram done by a professional ($5.00) yes. I know, amazing ! I love the color of the thread and the block style is the same as the Y on the mantel. I'm having so much fun making our home Cozy. I made a matching heart sachet, but the bow was being so stubborn that I just tied a knot. I love to recap my photos in a collage. Thanks Marty for throwing this great party. two granddaughters. We are planning to go to Water Works Park and water sking at the lake. The four cousins are getting together for sleep-overs and other fun activities during the week. Ages of girls are: 2 - 12 year olds, 1 - 10 year old and 1 - 8 years old. I hope you have a great week and think of me as I'm out on the beautiful lake laughing and watching my granddaughters learn to water ski. Thanks again to my wonderful followers that drop by and have a laugh or two. Great cloches, Betty! I love your new big one. That is huge! You are going to have a lot of fun with that. Hi Betty! Oh, congratulations on your big cloche! Looks beautiful sitting on your coffee table. I've enjoyed seeing your room - it's so pretty! That is such a cute inviting room. I love all your vignettes, especially the one with the books, red sphere, plant and moss....so nice. Love all your cloches! Happy to be a new follower! this is my first time to visit you, but you are my kind of girl!! Enjoyed your post and your new cloche is lovely, love the birdnest in there. All your vignettes are nice and your home looks warm, cozy and lovely. I love everything you have shared with us today. Thanks so much. Great addition. Great to have you be a part of Seasonal Sundays.